Since the 33rd America's Cup became the subject of a court case, BYM News has published three articles as a result of telephone conversations with leading figures at ACM, or Alinghi: Michel Hodara; Brad Butterworth & Hamish Ross; Brad Butterworth again. Throughout this period, BYM News tried hard to obtain an interview with Tom Ehman, Russell Coutts, or Larry Ellison of BMW Oracle, stressing that - as BYM News prides itself on its reputation for fair and balanced reporting - it needed to present a balanced view in this matter, which was impossible when only one side was willing to give further insights into its version of the story, other than general explanations on a website. This was explained in e-mail requests for an interview, sent to the BMW Oracle Press Office, in Valencia; the team's German agency and even to Larry Ellison directly. Only the Press Office responded and only to give a reason why an interview was not possible, at that particular time. Then, on October 10, BYM News was invited to send e-mail questions, for Tom Ehman to respond to and did so, next day. Four days later, the BMW Oracle Press Office said "... it now looks unlikely that we will get a chance to reply this week." Brad Butterworth had told BYM News "The trouble is that it’s now having an impact, not just on the business of the America’s Cup, but on the livelihoods of people involved. I’m not just talking about the sailors, the guys you see on TV, but on all the background people; those who work in boatbuilding, marketing, all the supporting industries. There are a lot of people all wondering where there next dollar’s coming from." BYM News, therefore, said to BYM Oracle, in the e-mail that accompanied its editor's questions for Ehman "My hope is that maybe some of the real, nitty gritty stumbling blocks might come to light, because I believe that it is only once the two parties truly understand the others misgivings and motives that a solution can be possible. Without a solution, prior to Oct 22, I believe this could still be in some Appeal Court in 2009!" The last communication that BYM News received from BYM Oracle, apologised for the lack of answers and added "Our desire remains to find a solution and we are working very hard on that." Below are the questions that BYM News failed to get answers to. If Desafio Espanol had won the Louis Vuitton Cup, this year, it would have automatically become the Challenger of Record for the America’s Cup. Would BMW Oracle have then objected, given that Desafio had not been entered by any yacht club – sham, or otherwise – but by the Spanish Federation? 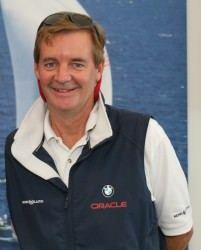 There have been very few American sailors in the BMW Oracle team and, in answer to a subsequent question, the Commodore said he had no objection to half a dozen crew members being non-nationals. Is that what you want? Are you planning on a campaign, for AC 33, in which the majority of the crew will be American? With the benefit of hindsight, do you think you could have had a wrong impression regarding those SNG plans you thought were in place? If so, is it possible that you could have a wrong impression about some other things? Do you think his opinion is also right on that point? Can a court case be avoided without BMW Oracle becoming CoR? It is a fact that the last protocol, when BMW Oracle was CoR, was changed several times and the new one has also been changed already. Why can’t you accept that this protocol will continue to be changed, as the last one was? You have repeatedly claimed that CNEV did not negotiate the protocol, but simply accepted what ACM/Alinghi wanted to have in it. How can you possibly know what negotiation did, or did not go on, behind closed doors, between CNEV and ACM/Alinghi? The only sign from 'the other side' appears to be statements that the protocol changes were just 'cosmetic'. Can you explain what you mean by ‘cosmetic’, as opposed to ‘real’, by giving an example of what you would see as a ‘real’ change to one of the items in contention? There is no doubt that the individuals and companies behind Team Origin, Shosholoza, Team Germany, Team New Zealand and Desafio Espanol all want to win the America’s Cup. Why would they enter the 33rd edition if, as you believe, they have almost no chance because the Protocol gives the Defender a huge advantage? What, in specific terms, rather than saying ‘a protocol like AC 32’, would Alinghi/ACM have to agree to, in order to get you to drop the court case?